Corky, aka Down by Dolan, is a 5-year-old white & blue male born December 23, 2006. Corky is of Irish descent. His sire is Pacific Mile (the same sire as Mimi) and his dam is Down By The Bay Jack, making his grandsire the late, famous Gable Dogde. 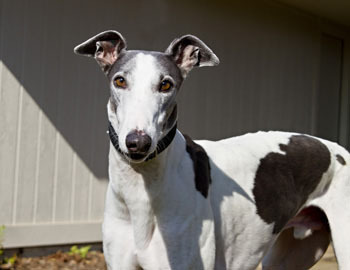 Corky has 105 races to his credit on Greyhound-data.com! 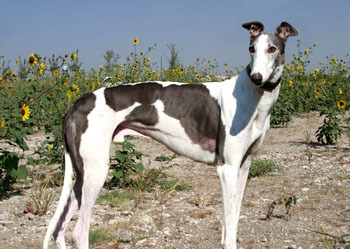 After starting his career in Florida on February 25, 2009, Corky moved to Gulf Greyhound Park in Texas in 2010 and raced there until August 7, 2011 when he suffered a career ending break to his right rear calcaneus and central tarsal bone. He had surgery at the Dallas Veterinary Surgical Center with Dr. Bob Radasch on Friday, August 12th. His surgery was more complicated than originally expected; and now, almost 4 months after surgery, Corky is ready to find his forever home! Corky has not been tested with cats or small animals.